ONE TREATMENT = 1-YEAR WARRANTY…NO BULL! 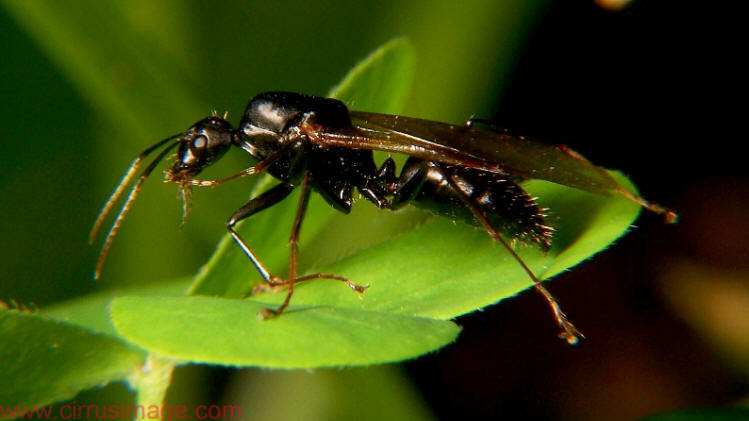 North Jersey Termite provides carpenter ant control that works! Carpenter Ant control begins with understanding their biology. The black carpenter ant, Camponotus pennsylvanicus, is the most common carpenter ant species in New Jersey. 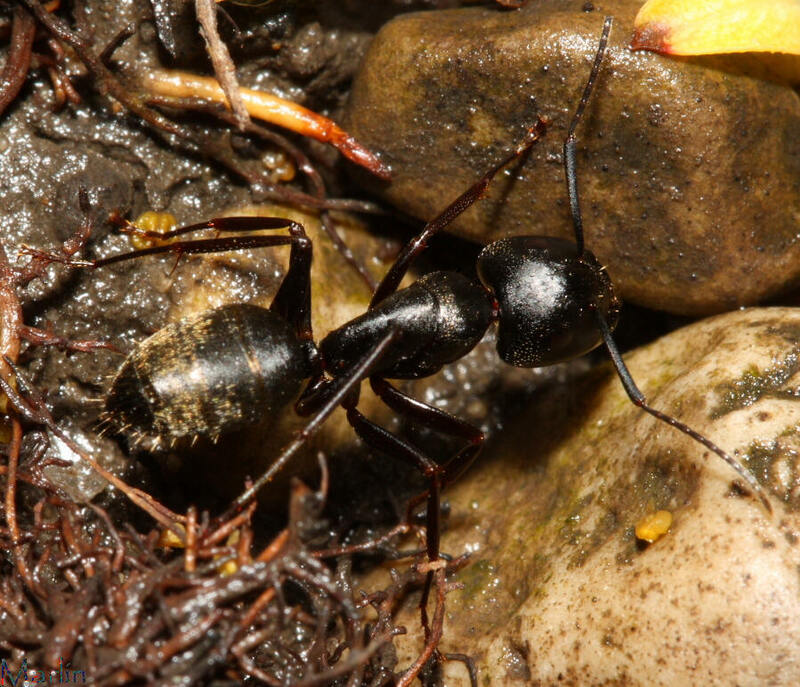 Foraging workers are 1/4 inch to 5/8 inch and black in color. Another species, the rust-colored carpenter ant, Camponotus ferrugineus, is a bit smaller and has a reddish-orange thorax with a black head and abdomen. The most diagnostic characteristic of all carpenter ants is they have a one-segmented pedicel (the segment between the thorax and the abdomen). The profile of the thorax is evenly rounded and not bumpy. Most carpenter ant workers are polymorphic—which means they are different sizes. 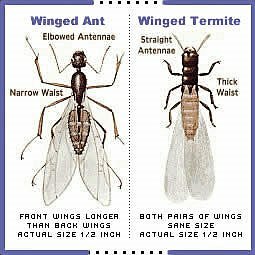 Entomologist refer to larger workers as “major” workers and the smaller workers as “minor” workers. Each colony has at least one “queen,” the reproductive member that produces all additional members of the colony. There may be more than one queen in a colony. When a colony gets very large (six- to ten-years-old and has more than 2000 workers), it may produce winged reproductives, called swarmers. They are often produced during the summertime and may overwinter in the colony. 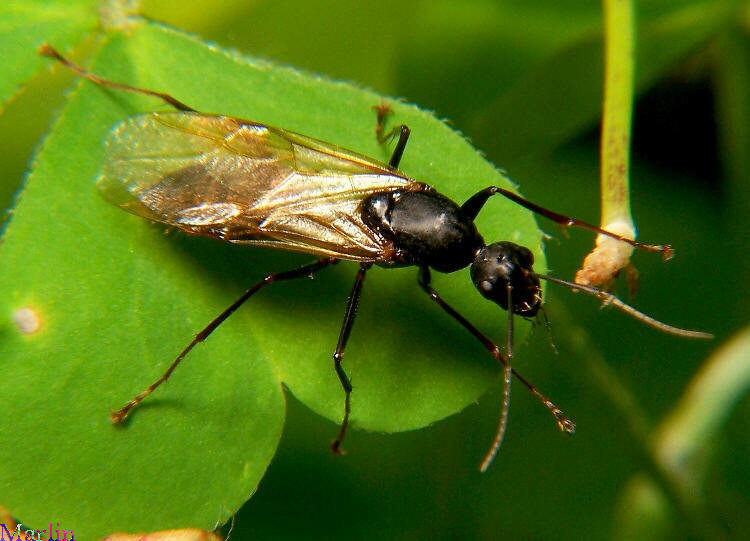 In New Jersey, we have people reporting swarms of the rusty-colored carpenter ants during periods of warmer weather from February to April. The black carpenter ants swarm a bit later and is more commonly observed from March to June, but we have seen swarming of both species during most warmer months. The males often emerge first and are smaller than the females. After mating, a single queen seeks out a suitable nesting site and lays only a few eggs that hatch into maggot-like larvae. She cares for the larvae that become the colony’s first workers, forage for food, and feed the young while the queen continues laying eggs. The diet of carpenter ants is quite varied and includes living and dead insects, honeydew from aphids, sweets, meat, and fats. They do not eat wood. Workers leave the colony in late afternoon or early evening, forage during the night, and return to the colony in the early morning hours. 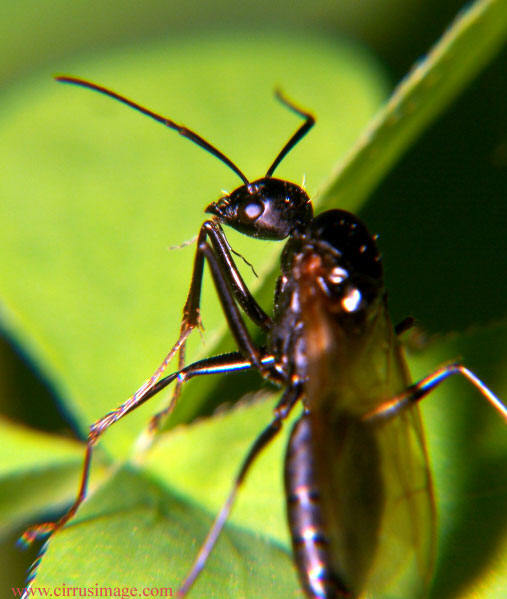 Carpenter ants carry food back to the nest intact or ingested and later feed it to non-foraging members in the nest. 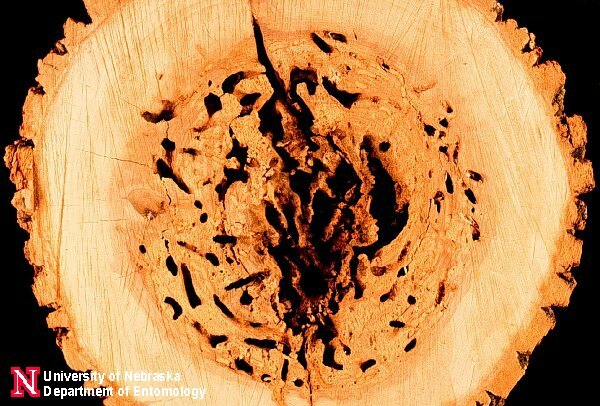 These ants may forage up to 100 yards from the nest to search for food. 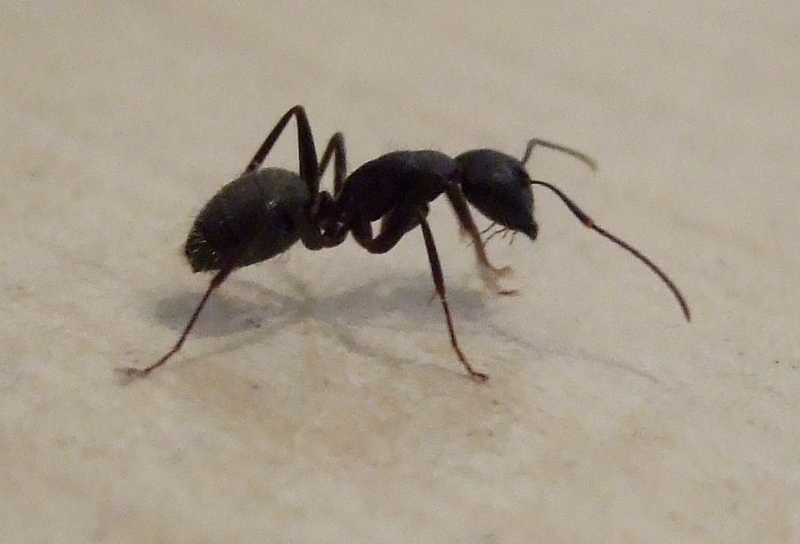 Carpenter ants may become pests in houses by foraging for food. 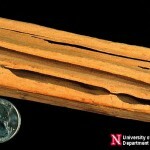 The greatest concern, however, is they may cause serious damage to wood in the structure. 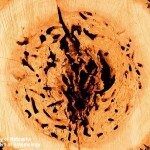 Unlike termites, they do not feed upon wood, but merely use it as a place to nest. Carpenter ants construct their nests in hollow trees, logs, posts, landscaping timbers, and wood used in homes and other structures. 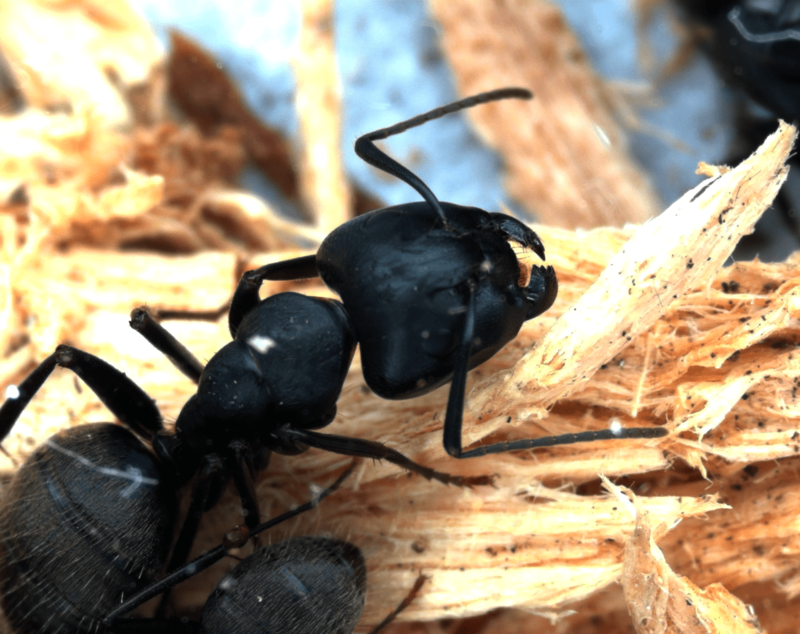 These ants prefer to infest wood that is moist and rotting, but wood that has been wet previously, may be soft enough to allow carpenter ants to hollow it out and produce a colony. Certain parts of a house such as: Around and under windows, roof eaves, decks, and porches are more likely to be infested by carpenter ants. Carpenter ants will use an old abandoned nest or wood that has been “hollowed out” by termites. Nests may be located in hollow doors or small void areas produced during construction. 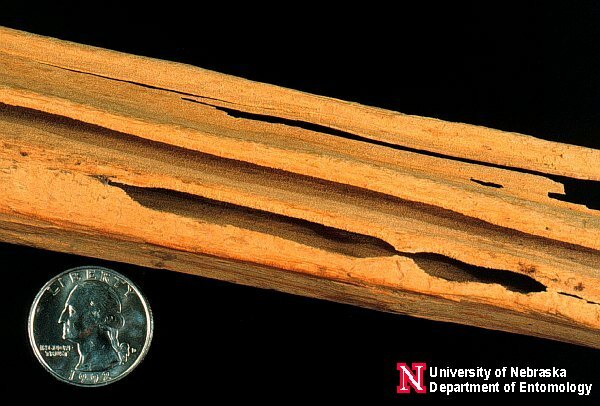 Carpenter ants may move from decaying portions of the wood into sound lumber in the process of enlarging the nest. They cut galleries with the grain following the softer parts of the wood. The ants leave harder parts of the wood as walls separating the tunnels and cut openings in these walls to allow access between tunnels. Access to the outside may be through natural openings, or the ants may cut openings where none exist naturally. Carpenter ants keep occupied galleries clean. They remove wood in the form of a coarse sawdust-like material, which they push from the nest. This often results in a cone-shaped pile accumulating just below the nest entrance hole. This pile may include, in addition to the wood fragments, other debris from the nest, including bits of soil, dead ants, parts of insects and remnants of other food they ate. Certain parts of a home are more likely to be infested by carpenter ants. Carpenter Ants can nest in numerous areas within the infrastructure of your home. They simply love moisture. Particularly wet wood around windowsills and doorframes as well as sub-roofing and sub-flooring in kitchen and bathroom areas. They can also nest inside hollow closet doors among many other common areas. 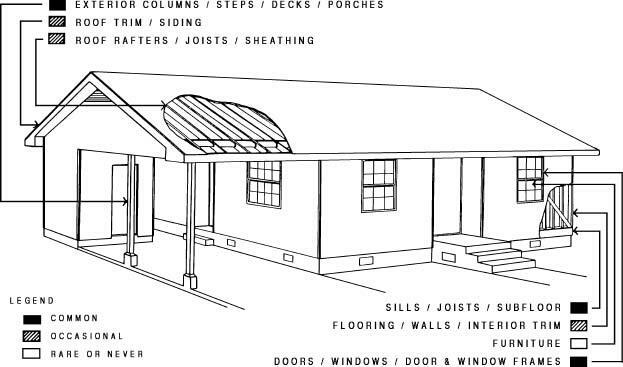 Refer to this diagram for the most common problem areas of a home. 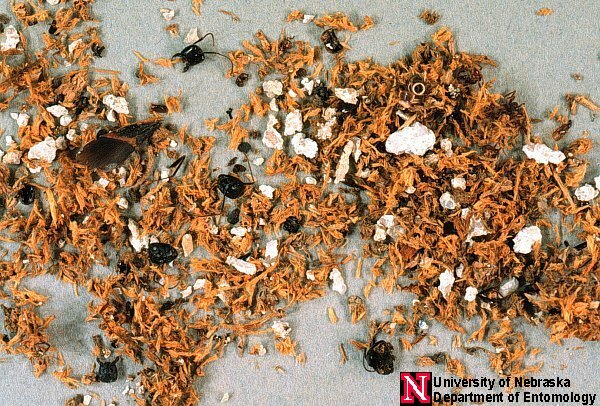 Colonies of many ant species can be controlled with baits, but Carpenter Ants have such a varied diet, baits are not always successful. In the past, spraying insecticide on foraging workers was of limited value because the queen will continue to produce more young. However, with the advent of the new generation of spray insecticides such as Phantom and Termidor, outstanding carpenter ant control results are often achieved by a single exterior application. Unique Solutions for Carpenter Ant Control – see effects on Ants in 1-3 Days! 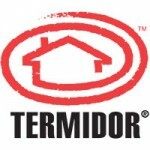 Termidor and Phantom are unique solutions for carpenter ant control. Carpenter ants are not directly exposed to the Termidor and Phantom-treated areas. Instead, the carpenter ant control is a result of ants coming into contact with affected ants. This “Transfer Effect™” means you’ll see its effects on ants in one to three days, and most species will be controlled within the first week following the treatment. This can result in control of ant colonies in the vicinity of treated areas. 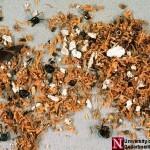 Ants not directly exposed to Termidor treatments will be controlled as they contact “Treated Ants”. 26 structures infested with carpenter ants or other species were identified and treated before July. Most structures received only an exterior perimeter spray of Termidor 0.06% under the lower edge of the siding and to the exposed foundation and to window and door frames. 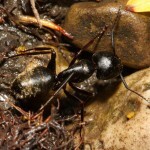 Termidor was extremely effective in the control of carpenter ants and other species of ants treated. Follow-up inspections and communication with homeowners showed consistent results in the control of each species. Results were evident within a day after application and effective throughout the summer months. Termidor was effective without the need to locate parent colony. Reinfestation of structures did not occur and the application was effective in keeping the ants from entering the structure. – Laurel DD. Hansen, Ph.D. Even with the advantages of Phantom and Termidor mentioned above, a direct treatment of the colony still may be necessary. The secret to controlling an imbedded carpenter ant infestation within a structure is a targeted treatment of the colony. We look for the piles of sawdust to locate the entrance. Because worker ants move from the nest to forage for food, their movements may lead to the discovery of the nest opening. We inspect the entire structure and surrounding grounds, because the nest or nests may be outdoors as well as in the structure. Once we find the colony, we can completely eliminate the infestation by removing all the infested wood. But, if there is a contributing moisture problem, be sure to fix it first. If we cannot remove the infested wood, we can inject a dust formulation of an appropriate insecticide into the wall void. A dust formulation is best, because the ants walk through the dust and contaminate the colony. We introduce the dust into the nest through the entrance hole using a hand duster with a tube with a tip that fits snugly in the entrance. We commonly dust in wall voids or other areas where the dust won’t come into contact with humans or pets. We may also use a combination of spray insecticide, granular bait and Gel in other areas. Initially, after the treatment, you may still see some ants crawling around. If you do, don’t kill them or spray insecticide around them. We want them to transfer the product to other pests. Once Termidor has had time to do its job, ant activity will stop. To prevent further carpenter ant infestations, trim all trees and bushes so branches do not touch the house and correct moisture problems such as leaky roofs and plumbing. Paint and/or seal exposed wood construction before it becomes wet. Replace previously ant- or termite-infested wood, rotted, or water-damaged wooden parts of the structure and eliminate wood/soil contacts. Remove dead stumps on the property and store firewood off the ground and away from the structure. Additional Ant prevention tips can be found here. 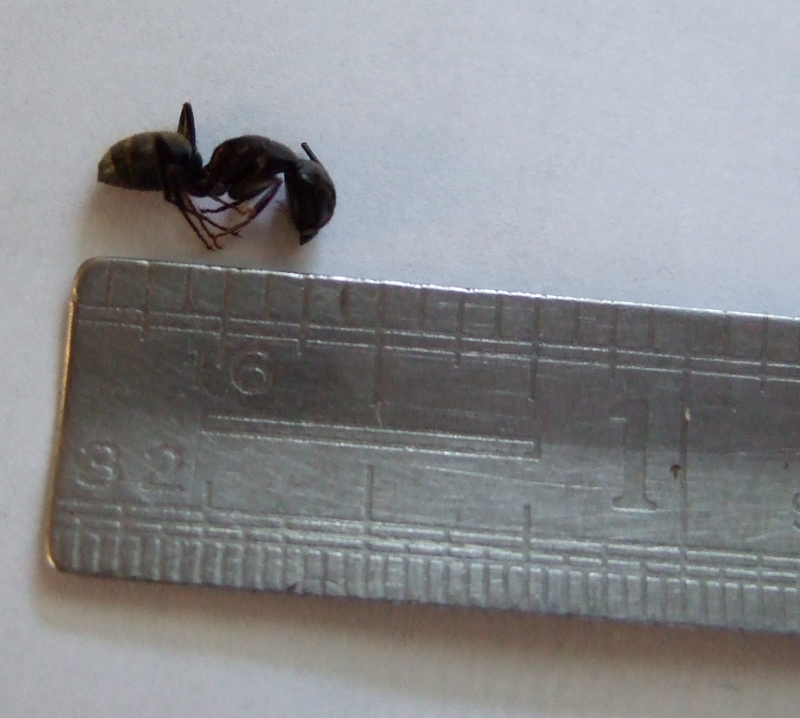 Dead Camponotus pennsylvanicus shown next to en:ruler for size.